Whether I’m in the classroom or on the stage, my teaching philosophy leads me to connect what we learn with how we engage with the world. At Syracuse University, I teach classes on writing, gender, race, and British literature. 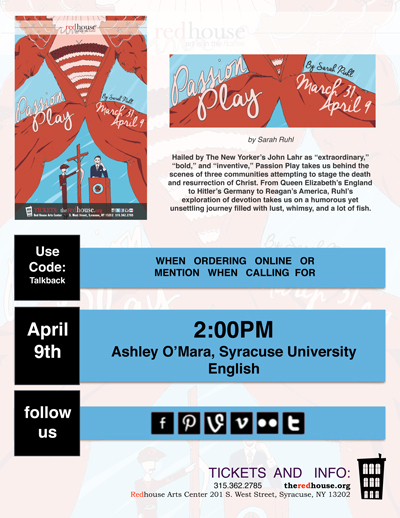 In the community arts scene, I have worked with The Redhouse and The Central New York Playhouse to lead audience conversations on theatrical performances. I practice a feminist pedagogy: my teaching style aims to level hierarchies in the classroom. This way, I learn as much from my students as my students learn from me, as I mentor them from wherever they’re at to wherever they want to go. I am available to teach, train, and coach public and private audiences on topics related to English literature, queer history, asexuality, and Catholic history and culture. Please contact me for more information. Talkback to Sarah Ruhl’s Passion Play, The Redhouse, 9 April 2016. I led an after-performance audience discussion on early-modern religion and theater, and its enduring impact on the politics of Christianity. 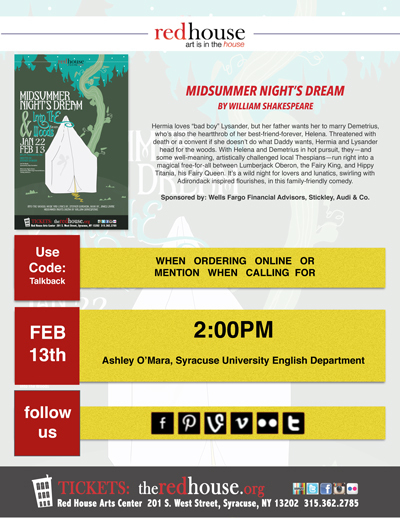 Talkback to William Shakespeare’s A Midsummer Night’s Dream, The Redhouse, 13 February 2016. I led an after-performance audience discussion on early-modern marriage, gender, and sexuality. I have developed lower-division college courses on composition through the lens of gender in world religions; a survey of British Literature, Beginnings to 1789; Race and Literary Texts; and Gender and Literary Texts. I also give guest lectures on subjects related to my research. - Race and Colonialism in The Tempest, ETS 121: Introduction to Shakespeare (Evan Hixon), Syracuse University, 12 April 2018. - Gender and Sexuality in Hamlet, ETS 121: Introduction to Shakespeare (Evan Hixon), Syracuse University, 27 March 2018. - Queer Representation in the BBC Sherlock Fandom, ETS 145: Reading Popular Culture (Rhyse Curtis), Syracuse University, 15 November 2017. In order to get to know my students and how I can help best teach them, I created this form that all students complete on the first day or when they add my course. 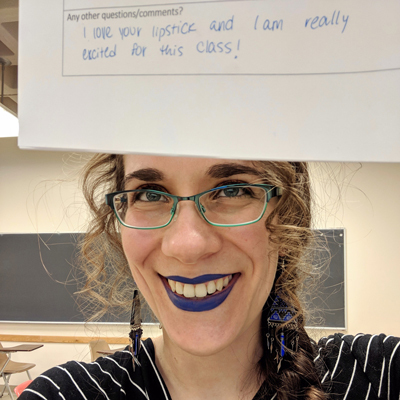 Highlights include asking for students’ pronouns and content warnings, for what their interest is in the class, and for what their expectations are for themselves and the instructor.